If you are a swimmer, then you will know that your shoulders are important! However, I find a lot of swimmers that come into the clinic suffer from an array of shoulder problems, and once getting down to the bones of it, I find that most of them are not doing appropriate dry land training to ensure their shoulders will perform for them in the water. We all know that general strengthening is good for us, but what many of us forget is that those strong shoulder muscles also need a strong base of support to work off. That being, your shoulder blades and thoracic spine. Therefore, in this blog, Shaun and I give you what we think are the five best exercises for swimmers, to prevent shoulder problems in the pool. 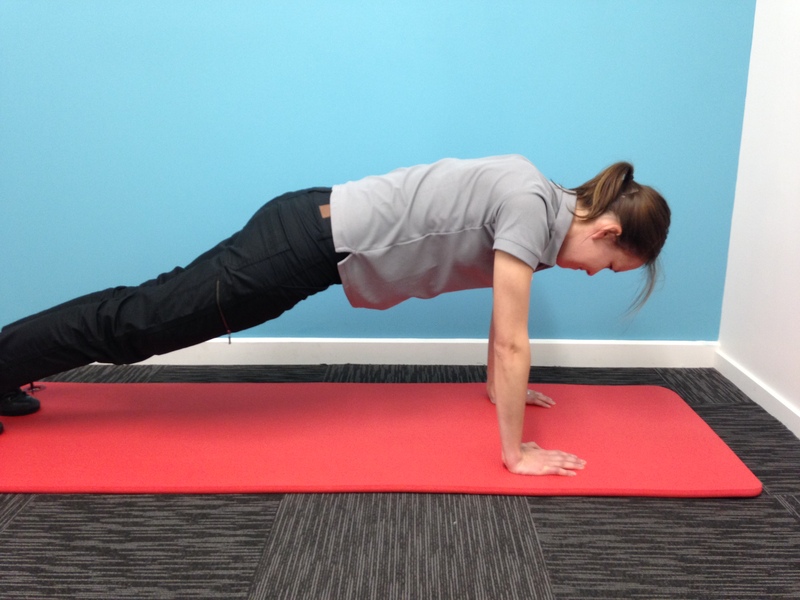 The push-up plus is a tricky one to master. Start in the position shown at the top of a push-up. Now all you need to do is the plus on top where you push your shoulders blades forward (body up) and then lower back down o the starting position. Repeat this for 3 sets of 12. Make it harder: Do a full push-up with the plus on top. 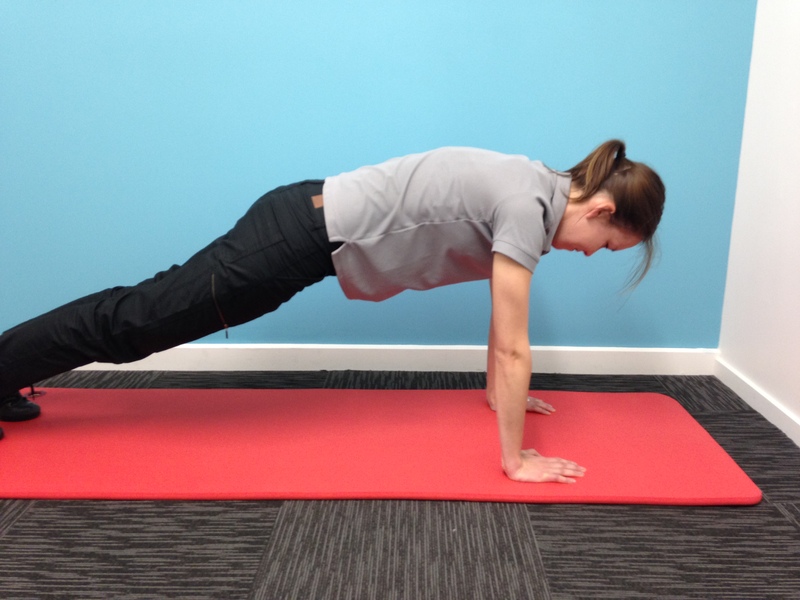 Start holding a side plank and holding a dumbbell in your top hand. The dumbbell (and your top hand!) should start on the ground in front of you. Now lift it up straight above you and then control down again. Make it harder: Lift your top leg up and down with the arm. 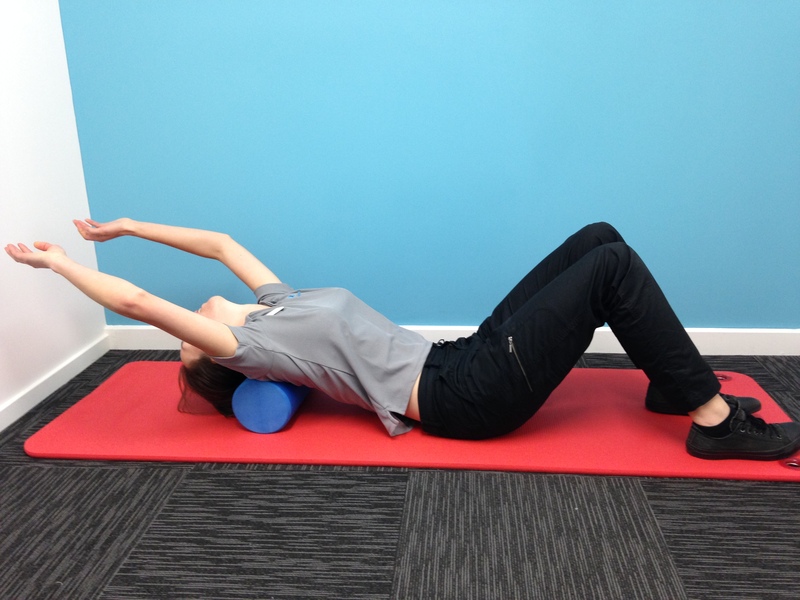 Foam rollers are great for improving your overhead range, gaining you that all-important stream line position. Lie on your back with the roll under your lower back – around the bottom of your shoulder blade to start with. Always keep your feet on the ground. Now hands your arms over your head and relax into the stretch. 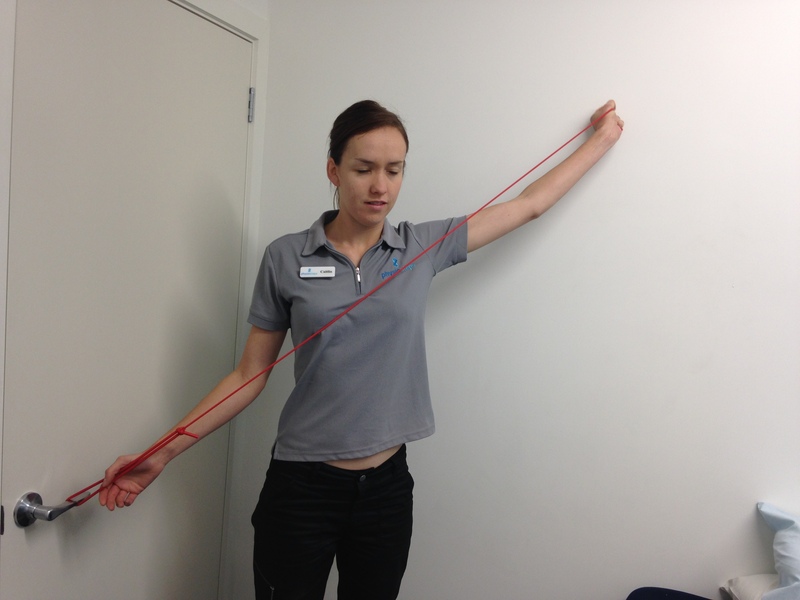 Hold this for 1 minute and then move the roll up higher for 1 minute each on mid shoulder blades and top of shoulder blades. Do a little extra: You can also wrap your arms across your chest, lift your bottom up and roll up and down, working through the muscles. This exercise is great for working the rotator cuff of the shoulder and getting your good strength in the overhead position. Use either a dumbell or theraband. Start with your hand arm across your body (hand at your opposite pocket) and then bring it up in the opposite direction as shown, ending with your thumb pointing backward. Make it harder: Instead of increasing the weight, first try it standing on one leg as a progression. The lats are important for swimmers so let’s get them right. The picture to the left explains the exercise well but just ensure that you keep your back straight and bend forward at the hips as shown. Now if any of these are too easy for you, too hard for you or you want something more specific to you – make an appointment with a physio near you and we can deck you out with all the strength and conditioning you need. On that note as well, if you do have a shoulder injury – don’t push through it, head along to your local physio and get it right ASAP. Otherwise – happy training and enjoy the exercises!